On a recent vacation to Brian Head, Utah, my family and I stayed in a traditionally styled log cabin that was filled with wood furniture the owner had fashioned from tree stumps left over from his home’s construction. Each piece – from the kitchen table to the night stands – was gorgeous, sturdy, and unique. Staying at that cabin for the week reconnected me to nature in more ways than one. The beautiful outdoors brought inside refreshed both my mind and spirit and I’ve since been a little obsessed with bringing more natural elements into my home. 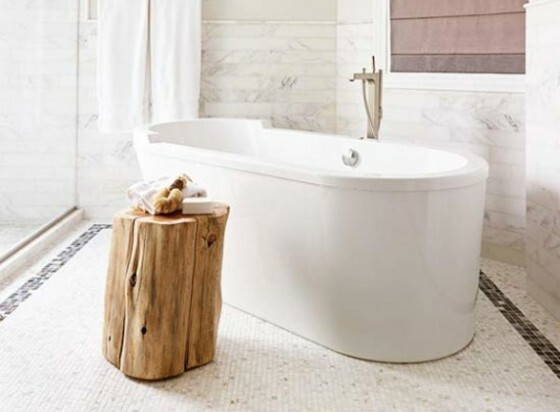 There’s something so organic and grounding about adding wood, rock, and plant elements to a home’s interior. I especially love the idea of grouping tall branches as a room screen. 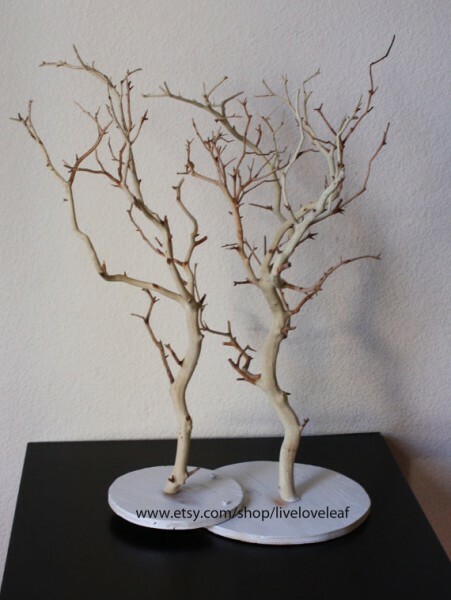 Simply fill glass jars with stones and place the branches inside. Line the jars up next to each other on the floor and use them to separate room areas. 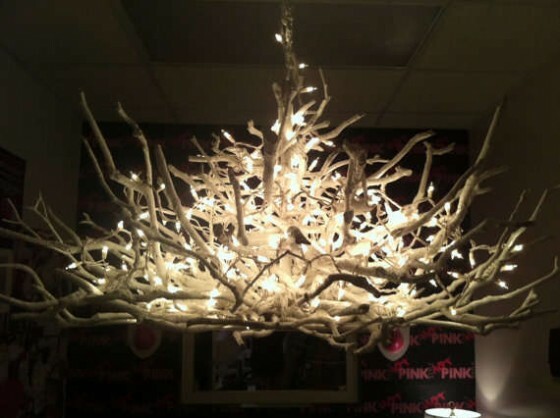 Another cool decor concept is to create a light fixture using branches. This one is way beyond my capabilities, but I adore the look of branches hanging from the ceiling using twine and wrapped with a light source. A simple Google search will turn up dozens of tutorials for how to achieve this look. Other decorative concepts with wood include using driftwood or reclaimed barn wood as a make-it-yourself mirror frame, or using branches tied with twine or hemp to adorn the walls. For the latter, just anchor medium-sized L brackets to the wall, set the wood on the brackets and screw the wood to them. You can place a bowl of rocks in a low glass container and put it on a bathroom countertop. I found a large, smooth stone that looks an awful lot like a giant zen rock and let it sit alone on my counter, surrounded by low candles to keep the look simple and streamlined. If you’re a do-it-yourselfer, one idea I particularly liked involved gluing (use a polyurethane-based glue) found stones to the ends of wooden drawer knobs and then screwing each knob into a plank of wood to use as a coat or hat rack in the entryway or as a towel rack in the bathroom. You can also glue rocks around a picture frame or on a wooden mirror frame for an organic touch. Or, how about an indoor Japanese zen garden? 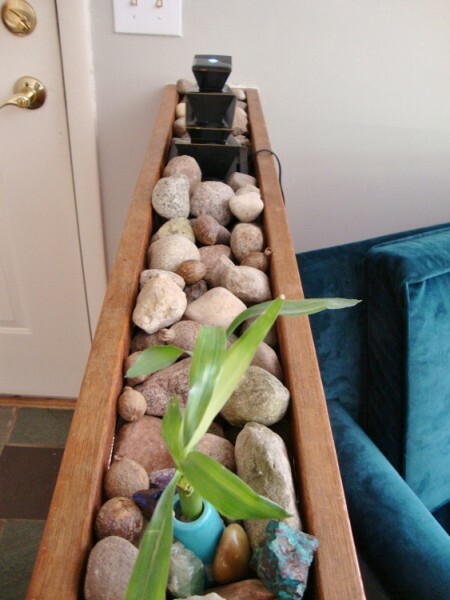 Take a wooden planter, fill it with rocks of all sizes and place bamboo in small vases inside. Placing this creation behind the kitchen sink or toilet adds a pretty touch to otherwise empty spaces. I once visited a home set with several terrariums of all sizes and it really made a statement. There are so many ways to go with terrariums with a wide variety of plants and other elements to incorporate that the sky really is the limit for what look you create. Making a terrarium is quite simple if you get the right materials. First, find a glass jar you like and place a handful of rocks on the bottom. Add some activated charcoal to keep the terrarium free of bacteria, fungi and odors, some fresh moss (sheet or fern mosses are terrarium-friendly) and a thin layer of potting soil over the rocks. Find a plant that will do well in this indoor environment. If you use cactus or succulents, be sure to use the type of soil best suited to them (cactus soil). Note that almost any house plant will work, but be sure they’re hearty and small. Keep succulents and cacti together and fern and tropical plants together, because they require different amounts of water and soil. Whatever you choose, take your plant out of its pot and break up the soil ball to get to the roots. Dig a space for your plant in the terrarium and add some soil to the base of the plant. Add enough soil so the plants’ roots will have plenty of room to fit and grow. Aim for a depth slightly greater than the height of the plant’s pot. 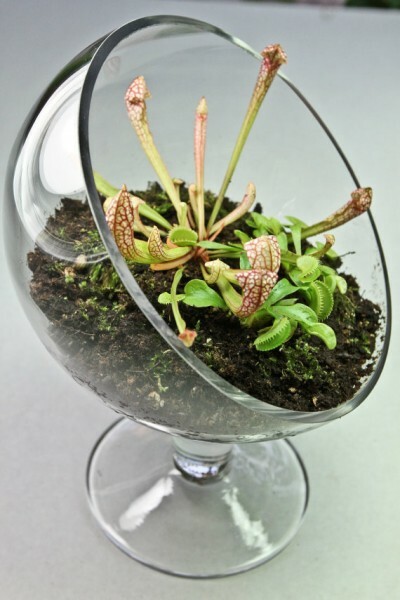 You can add several plants of varying heights and place additional moss, rocks or other elements like glass beads, figurines and so on to jazz up the terrarium. You can also incorporate the outdoors by using natural fibers and textures in your decorating. Wicker, jute and rattan are beautiful materials you can buy in baskets, rugs, and lamp shades. Bamboo-textured wall paper looks so organic in a bathroom and if you’re painting, blues and greens evoke the outdoors and can complete your design. All elements from nature, from the sea (coral and shells) to the forest (branches, moss) can be used, giving your home a fresh and clean feel. 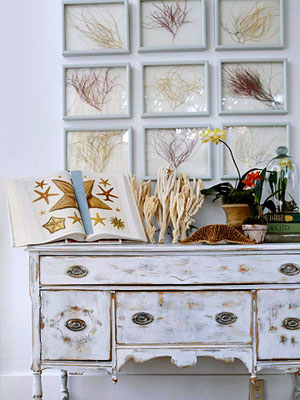 For your walls, dried leaves, sea grasses, and flat shells look pretty framed and hung, and almost anything from coral to small rock formations can be added to bookcases and even glass jars. Decorating with the simple elegance and beauty of nature is truly one of the easiest and quickest ways to enhance your decor. 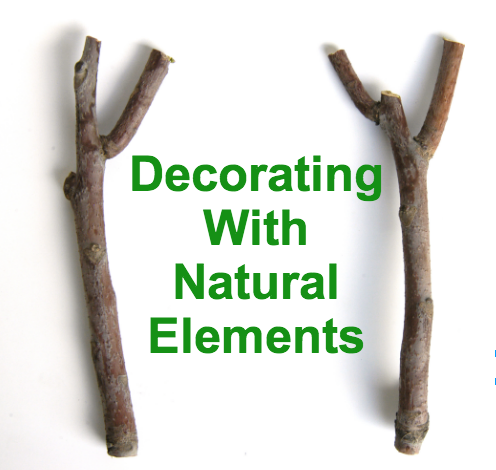 Usually, it’s the simplest accents that make the greatest impact, and a quick look outside may be all you need to find natural materials to add to your home’s decor.